A guest post by Cate Hagman, former staff member and current volunteer for Washington Revels. 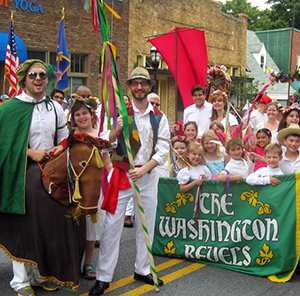 It sounds like the beginning of a joke, but it becomes reality each 4th of July when Washington Revels steps out and sings out at the Takoma Park Independence Day Parade. 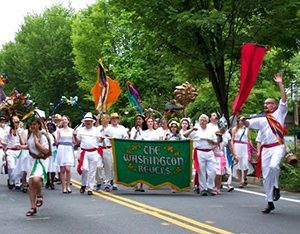 Whether the temperatures are in the 70s (this year) or inching towards the 100-degree mark (2012), several dozen revelers of all ages can be relied upon to sing, play, and march their way through a community institution, and share a few centuries-old traditions in the process. That’s where the hobby horse comes in, bounding across the parade route and bowing to delighted onlookers, while marching musicians (accordionist, fiddler et al) play merry tunes, a jester cavorts, and the women, men, and children of Washington Revels sing songs of simpler eras, “Country Life” being a particular favorite. I like to rise when the sun she rises early in the morning. I like to hear them small birds singing merrily upon their laylums. And to ramble in the new-mown hay. The parade or procession is an essential element within Washington Revels’ seasonal celebrations, whether it’s the merry march across the grounds of Washington National Cathedral to celebrate springtime (May Revels) or through the Maryland suburbs at summer’s end (the Kensington Labor Day Parade), and it fits beautifully into the Washington Revels mission, bringing joy, celebrating tradition, and building relationships within the community and the region. Of course it also affords a pressure-free, family-friendly way for revelers of all generations and talents both to perform and to connect with new audiences. So if you see a jester gamboling through your neighborhood or a dragon peeping over a hedge, stay calm. They’ll no doubt be accompanied by a jubilant but peaceful army that includes preschoolers and septuagenarians, teens and soccer moms, all on the march for community, tradition, and celebration.